Faculty and staff members attend the EmbraceRace session on Tuesday, Mar. 26. Jenna Pierson/Mitzpeh. EmbraceRace @ UMD, a new initiative that was pioneered by the Office of Diversity and Inclusion and began at the beginning of this semester, met for their fourth session on Tuesday in the Edward St. John Learning and Teaching Center. The initiative meets every other Tuesday and was launched in response to both university and public concern over the increase in hate bias incidents on campus. “We want to provide a consistent space for a faculty and staff learning community to build and improve skills to challenge racism and improve racial diversity and inclusion,” said Donte McGuire, a founding committee member and PhD student in Student Affairs and International Educational Policy. 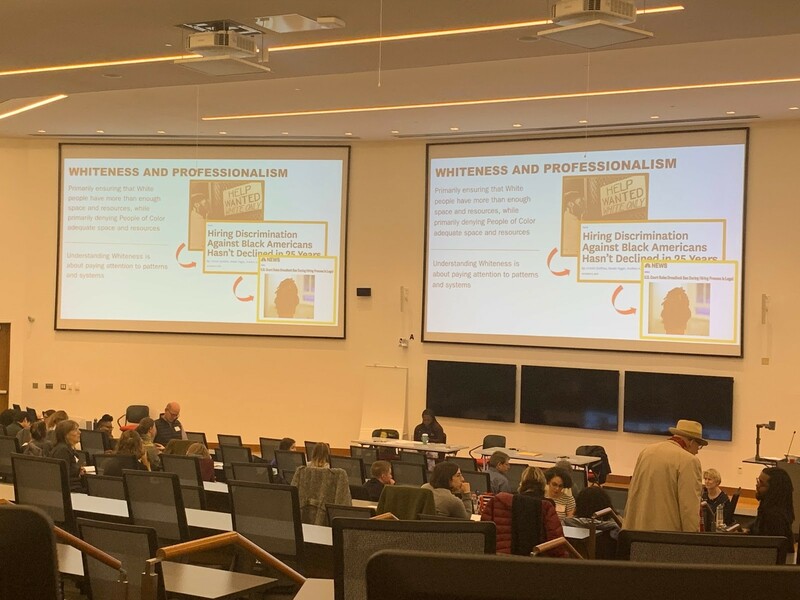 Popular topics of discussion were recent examples of discrimination and how they pertain to job access and comfort in the workplace for persons of color, which led to actions such as dreadlock lawsuits. This university is no stranger to hate bias or racial discrimination. These harsh realities were seen in the racially-charged fatal stabbing of 2nd Lt. Richard Collins III on campus in May 2017, one of several prominent events in recent years that has facilitated the response of initiatives to promote a safer and more inclusive environment on campus. In November 2018 alone, more than seven hate bias incidents were reported on campus, varying from anti-LGBTQ language to anti-Semitism, according to The Diamondback. According to an optional Campus Climate Survey that was conducted by the Office of Diversity and Inclusion on campus in 2018, only 28% of black and African-American students reported having a “sense of belonging” on campus, while nearly 46.8% reported wishing they chose a different school. The numbers were 28.7% and 31.1% for Latinx students and 17.8% and 40.5% for Asian students, respectively. No Replies to "New faculty, staff panel addresses issues of race, discrimination at UMD"